– finalise arrangements for BBPlan Neighbourhood Exhibitions and Consultation in May 2019. We will be launching the consultation on the draft Neighbourhood Plan with public exhibitions in Baldock Community Centre on Fri May 3rd (7-9pm) & Sat May 4th (10am – 12 midday) 2019 . Please do come along and find out how the Neighbourhood Plan aims to achieve a better future for Baldock, Bygrave and Clothall, and how you can have your say. Members of the neighbourhood planning group will be on hand to answer any questions about the plan. The draft Neighbourhood Plan and its accompanying Design Guidelines will be available for comment for 6 weeks from Tuesday 7th May 2019 until midnight on Tuesday 18th June 2019. Details of how to respond will be posted on this website nearer the time..
As part of the consultation on the Neighbourhood Plan we will be giving our exhibition a further outing, and members of the neighbourhood plan group will be on hand to answer any questions about the plan and how to let us have your views. Details of future public meetings to be held during the compilation of the Neighbourhood Plan, will be listed on this page. This Consultation has now completed. For more details see Activities-so-far page. 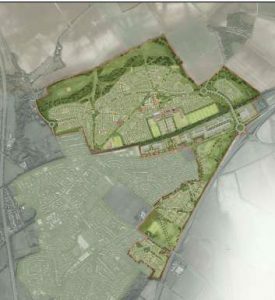 Below is the HCC Map of possible Baldock developments, as at January 2018. Walks around areas of concern / interest. Further walks may be arranged to walk around other ‘areas of concern’ identified during the Consultation period. Details of the first two walks can be found on the Activities so far page. 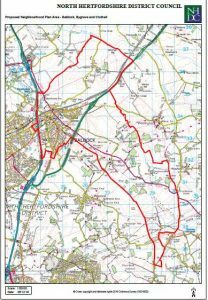 the map includes Luffenhall, which is part of Clothall Parish area. Details about previous BBPlan Activities can be found on the Activities so far page.